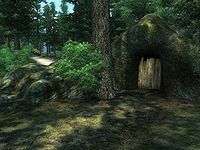 Greenmead Cave is a medium-sized cave northeast of Skingrad containing monsters. 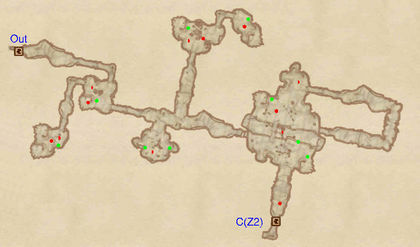 It contains three zones: Greenmead Cave, Greenmead Soggy Hollow, and Greenmead Inky Grottos. This cave contains 15 Cairn Bolete plants and 27 Wisp Stalk plants. The third area is home to a Giant Mud Crab. 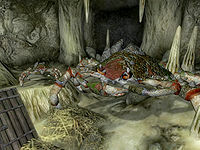 It is three times larger than a regular crab, roughly the size of a Land Dreugh. 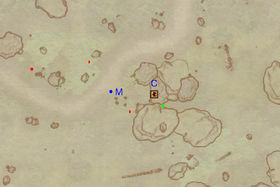 This location's map marker (M on map) is named Greenmead Cave (editor name GreenmeadCaveMapMarker). The entrance door is E of the marker, 60 feet away. The route through this zone is fairly linear, although there are three detours worth taking. In the first room you will find a minor loot chest, up to two enemies and a tunnel in the northwestern corner. This leads to a small room with a chest and up to two enemies. Midway through the next corridor, there are rooms to both your left and right. The former is actually made up of two small rooms with two chests and up to three enemies between them. The latter holds two minor loot chests, potentially guarded by an enemy. You will then emerge at the bottom of a canyon in the middle of a large room. If you are lucky, it will be undefended and you will be able to loot the nearby chest without disturbance. Otherwise, your fight with the enemy is likely to draw the two enemies above into the fray. Make your way to the upper level and loot the three chests. Dispatch the last enemy and head to the next zone through door C.
This zone is essentially a large horseshoe with four rooms and very easy to navigate. The first two rooms hold up to three enemies, while the last two hold up to two. 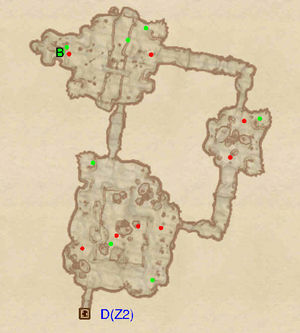 The first and last rooms contain two minor loot chests, while the intervening two hold only one. 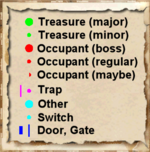 There is also a fifth room to the north of the first one, with a minor loot chest guarded by an enemy. The first room is rather large, with a lake in the middle. Two enemies and two minor loot chests are found on the edges of the water. The lake itself contains two mudcrabs and another chest. 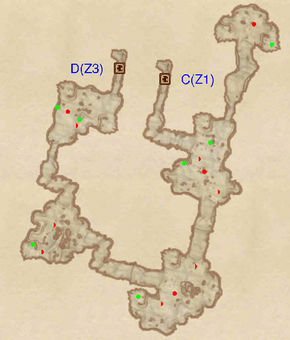 Swim down and into the eastern tunnel - you will emerge in a room with a rocky outcrop covered in wisp stalk plants. Two enemies guard a minor loot chest here. The next room is cut in half by a water-filled canyon. On the near side is an enemy and a minor loot chest. On the far side is the Giant Mudcrab, guarding the boss chest (B) and a minor loot chest. Once the fierce beast is slain, jump into the canyon, loot the nearby chest and swim back to the first room.